The main villain this time around because you know there will be a sequel is Thor's brother Loki. If you haven't seen it yet the setup for this is in the end post credits of Thor. The team has been recruited by cameo's from Nick Fury played by Samuel L. Jackson in the previous films. If you have not seen all the films but have a basic understanding of the characters thru any of the various versions over the years, you can walk into this without being lost. This shouldn't stop you for a nice little home viewing party of all the previous movies. I myself haven't see the Iron Man movies or the last Hulk version with Edward Norton, I tend to lean towards the DC Comics side, its more than a lean i'm practically horizontal. The movie focuses on Loki's plan to take over Earth, he wants to rule and piss off his brother at the same time hence partly why earth is a target. 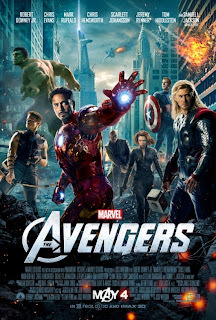 The movie slowly brings the Avengers into the fold one by one so you can get pumped as they are brought it. There's so much to take in but the film stays with comedy and action. The Avengers don't all even know of each other and of course their meetings will be chaotic. The fight scene between Captain America, Iron Man and Thor is pretty interesting and filled with one liners. When we finally get the payoff of the Hulk being released its both amazing and still funny. I give this movie - Pay full price. Its completely worth every single penny. The only caveat is its playing in regular, 3D and IMAX. I tend to very rarely recommend 3D and i'm not going to recommend it here either. There is so much to love about this movie. I couldn't remotely find a bad thing about it. Stick around all the way to the end for 2 post credit scenes. The Avengers is rated PG-13. This movies clocks in at 2:23 so be ready for a long but highly entertaining few hours. All i can say after walking out of this is The Dark Night Rises better bring it.